Two away games await us this week starting at Bolton on Wednesday night, our first midweek away trip of the season – don’t forget this one is a 8pm K.O. Considering the move to all midweek games now being streamed live it will be interesting to see if this has an impact on the travelling numbers. Especially when combined with a £30 ticket. 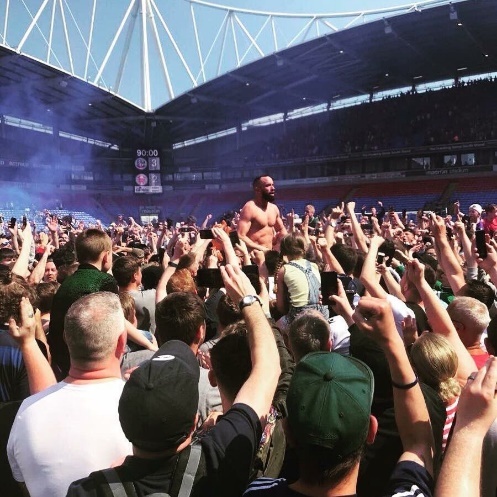 You sense that Wednesday’s game at the newly named University of Bolton Stadium will be remarkably different to our last visit on the final day of last season – a mass pitch invasion would certainly be a surprise turn of events! It was rather nice for us not to care really about the result that day with the possible exception of maybe wanting Nigel’s Burton to survive, especially having ensured our own last day panic the season before. But I got swept up nonetheless in the drama of it all, a topsy turvey melee perfectly capturing the wonderful theatre of football. We mocked the home fans about their impending drop into League One as we were enjoying what looked like a rare away win to end our season on. I can’t remember a more euphoric reaction in a game that Forest didn’t have a vested interest in. It was almost enjoyable to watch if you take out our own embarrassing capitulation having led with just minutes remaining. In amongst the delirium when that winning goal went in was one moment of panic as a flare set fire to a jacket just to our right; thankfully the flash of flame quickly disappeared leaving just a fascinating mass of bodies. I was envious not to be part of it. This time around the stakes aren’t as high and the crowd will almost certainly be less in number and less on edge. We certainly need something more than we did the last time we stepped inside the Macron / UoBS. The defeat at home to Norwich putting a thick stripe of black paint over the gloss that had shone so brilliantly white through the international break. There isn’t much to talk about here – if you are Nottingham based then trains are a non-starter unless you want to leave the game early and arrive back home in the early hours of Thursday morning. The last train departs at 21:35 and with this being a 8pm kick-off the game the train just isn’t feasible. By car the stadium is fairly easy to reach off the M61 Jct 6. Those who arrive early may find some parking in the Beehive (if you are stopping there for a drink) and there is usually parking available at St Joseph’s High School for a price. Coming off the M61 head right and you will soon pass the stadium. The Beehive pub is at the end of the dual carriageway smack bang in front of you on the roundabout. The school is first left at the roundabout. Street parking always seems to be hard to come by anywhere close to the ground. When we played at Bolton some years back on a Friday night I cut around the back to join the M61 at Jct 5. A very easy detour and one that cut out the traffic coming out the ground and trying to leave via Jct 6. As explained below by our Bolton fan the Beehive is the only real option around the stadium. The 2-3 other pubs that do exist often have strict home only policies in force. The Beehive is okay though – a big place, part of that Fayre & Square chain. It’ll be where most Forest head to and it’s a ten minute walk from there to the away end. Bolton town centre is a couple of miles away at least and will be a struggle to reach for the majority. The one pub I have been inside in Bolton was hopefully not representative of the rest. Regardless it’ll be too far out the way for most of us. 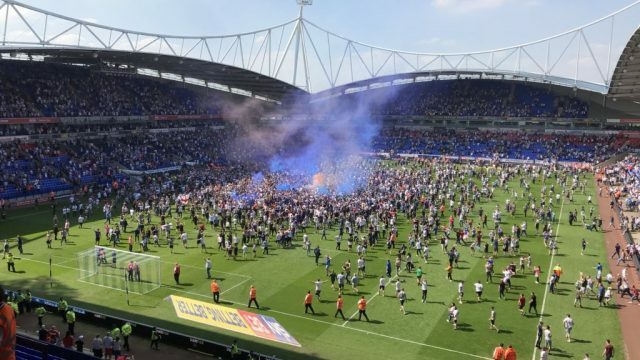 Explain for us what the final day of last season was like from a Bolton perspective? To be honest I still can’t quite believe it actually happened. At the time when the team was announced I think most people were expecting the worst, a 38 year old striker with one goal all season starting ahead of our only prolific striker in Adam Le Fondre, what could possibly go wrong? As you can probably imagine the 90 minutes that followed were something of a blur, when Alfie came off the bench and scored to make it 1-0 I still didn’t feel safe, this is Bolton Wanderers at the end of the day and in Bolton fashion, 10 minutes later Forest were 2-1 up and you couldn’t blame anyone for feeling it was over and another season back in League One was on the cards. Of course the final 15 minutes of the match is something that I will remember for the rest of my life (I still re-watch the clip now) David Wheater, Bolton’s longest serving player scored to make it 2-2. The Macron was on edge, goal kick for Bolton and echoes of ‘Attack, Attack, Attack’ rang round the stadium. The goal kick found Alfie who crossed it and that was the last thing I saw before I was launched three rows forward, in the words of local radio commentator Jack Dearden, ‘They’ve scored! 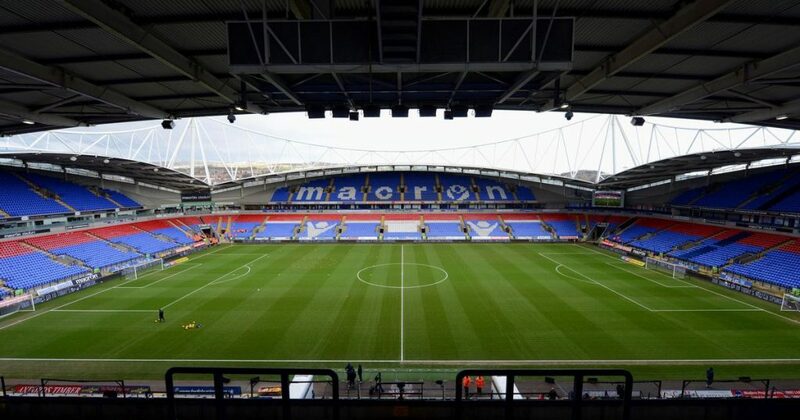 Bolton lead 3-2, Wilbraham with the header and the Macron stadium has completely exploded’. It was a surreal experience, thousands of Bolton fans on the pitch, Aaron Wilbraham carried off the pitch as a god. We were safe, another season in the Championship and another memory made. 2. How are you faring so far this this season? Better than last year that’s for sure. Personally I feel it’s been a good start to the season, we’ve beaten promotion favourites West Brom at the Hawthorns and Derby at home however we have had a dip in form recently, one win in nine and most recently a 1-1 draw with Rotherham, we will need to start picking up wins again or it could turn into a repeat of last season. Our team is much improved from last year, Josh Magennis and Pawel Olkowski (The Polish Cafu) have been big favourites of mine and Jack Hobbs has settled in well in the heart of our defence, thanks for him! 3. The club have been in the news a fair bit of late due to financial issues, specifically money owed to the HMRC, which follows stories about player strikes in the summer. What’s the latest on that front? To be honest your guess is as good as mine. As far as I am aware all money owed to HMRC has been paid and the much publicised Blue Marble loan has been paid, however under our Supreme Leader Ken Anderson, winding up petitions and threats of administration have become part and parcel of everyday life so I am sure we will hear about another debt being owed soon enough. In regards to the player strikes, this is something that could have been easily avoided if Anderson had paid the players on time and paid them their bonuses, he refused hence the strike. As of a month ago I believe ex Wanderers midfielder, Karl Henry was still owed part of his wages from last season. 4. If I may, I’d like to ask your thoughts on ticket prices for away fans at the Macron. It’s £30 for us on a Wednesday night which I’m sure is going to put people off travelling, especially with all midweek games now streamed live on Sky Sports. We also paid around £35 last season. Are Bolton getting it wrong on this front or do you think the pricing is fair? It’s an expensive week for us as we are paying £39 at Leeds three days later. I wasn’t aware it was £30 for away fans on Wednesday but I am not shocked, I wouldn’t blame any fan for staying at home and watching it on Sky as opposed to travelling to the Macron (Now the University of Bolton stadium). The club were recently charging £36 for home fans at our recent fixture vs Blackburn so as you can see, it is something that affects both home and away supporters. Overall I would say that the club are getting it wrong on this front however I do feel that part of the reason our ticket prices are so steep is because of our financial position so we do try to cash in when the bigger clubs come to the UniBol. I am sure that if you asked any Bolton fan they would agree that our ticket prices put people off from attending and are in need of a review. 5. I expect somewhere close to 1,000 will be there in the away end. Where do we head for a drink before? Unfortunately due to the location of our stadium the only local away friendly pub is the Beehive, it is a five minute walk from the stadium and is clearly signposted. If you are coming by train it may be an option to get off at Bolton and head into the centre for a few drinks there but it may be wise not to wear club colours. 6. With it being an evening game most will probably be heading by road but is the train line back and up and running now from Manchester to Horwich Parkway? It’s been shut the last three times we’ve visited. The trains are still all over the show at the moment, they do run directly from Manchester to Horwich Parkway throughout the week but I believe the last train back from Horwich Parkway is at 21:12 and with Northern Rail there is a high chance it will be cancelled. If I was an away fan I personally wouldn’t risk travel by train unless you intend to stay the night. 7. On the subject of travel, is there anywhere to park? Any free street parking about? I would try to stay away from the official car parks, I believe they charge fans £8 a match. I believe the Beehive tends to be the go to place away parking and that is charged at £5. I will be honest I don’t normally drive to matches so I am not fully up to date on where is the best for free parking. 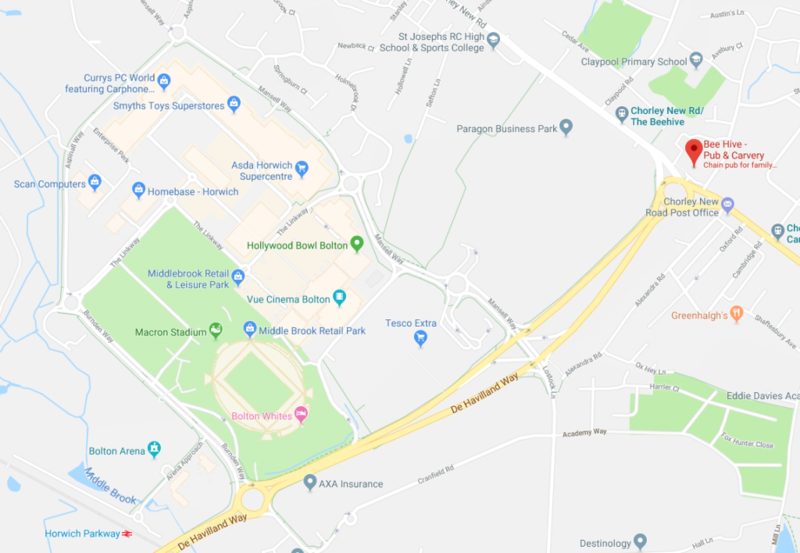 You could head to one of the local estates which are situated around the Beehive pub and you could also chance it and park on the Middlebrook retail park however you can run the risk of a parking ticket. 8. How do you think this one is going to go? Score prediction? I don’t think it will be as lively as last season that’s for sure. A win would be a great boost for Bolton but I would be happy with a point if I am honest. You’ve got some great players and I especially look forward to watching Carvalho play. I’ll go with a 2-1 win for Bolton and of course, Jack Hobbs scoring the winner for the Wanderers. 9. And finally – what would represent a good season for Bolton Wanderers? I would be happy with a mid-table finish this year, as much as I enjoyed the finale to last season I don’t think my heart could go through that sort of emotion again. Anything between 21st and 10th would be suit me.